Last January I only had 6 blocks completed. The block size is approx 12 x 12 inches and totally made from scraps. This was my "just having fun" kind of quilt. 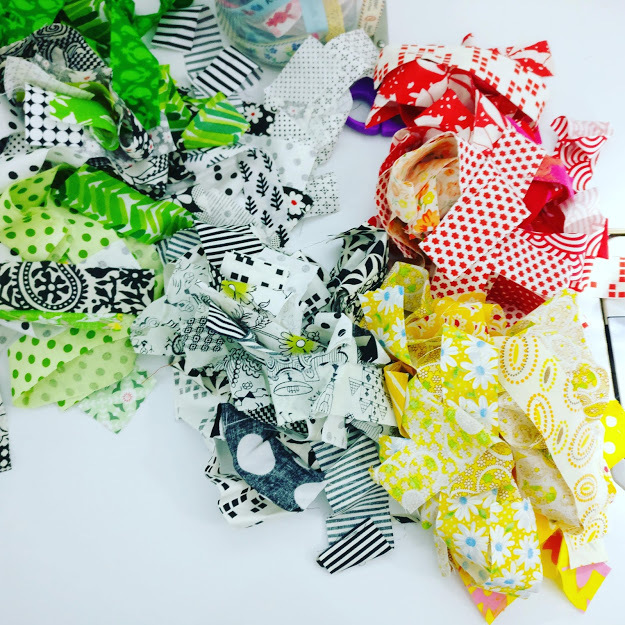 I cut the scraps into 1.5" strips and using sew and cut method. Almost like quilt as you go method without the quilting part. The fabrics were of all kind of weight, as long as the color match! I did not follow any rule and I kind of loving this process. 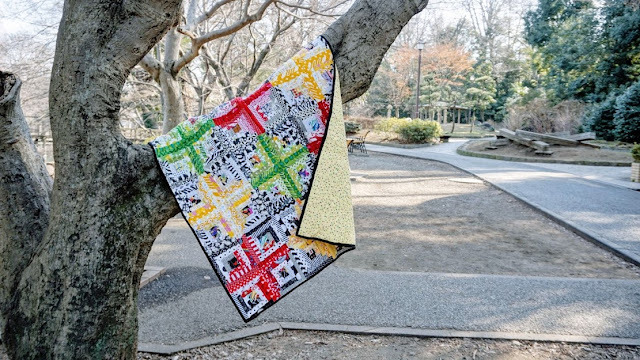 And here's my quilt hanging on the tree trunk at Inokashira Park! It was a nice sunny day when we decided to take the quilts out and find a good place to take photos :D. Yeah, we're crazy like that! Many morning walkers were glancing/looking and smile at us :D .
I still have a lot of scraps. I've cut a few in different sizes and have a couple of ideas. Let's see I hope I can create something bigger than this scrappy log cabin! Thank you for stopping by & spend time reading my blog! The Tokyo International Quilt Show held annually at Tokyo Dome. It needs no introductions. Last January, I've been very lucky to be able to go and see for the 3rd time and it still never failed to amaze me. The quilts and the people. We were lucky to be given free opening ceremony tickets (read in my previous post) and we were there before 9 AM on the opening day! We stayed in Mystays Hotel Higashi Ikebukuro which has easy access to Tokyo Dome. From the hotel, you can take either JR line from Otsuka Station to Suidobashi Station or Subway Marunouchi Line from Shin Otsuka Station to Korakuen Station (This is the fastest!) and great view too. It was really amazing experience since we could see all the displayed quilts before the crowds entered. The Kimono Quilt - There are 1500 of them !! Main display featuring Monet's Garden - my fave! The Monet's Garden was simply marvelous! The artist's interpretation from the real Monet's garden was simply amazing! Once inside the Dome, we were lost in the quilt wonderland! Before we knew it, it was dark and time to head out with a box full of fabrics & books and head full of ideas. 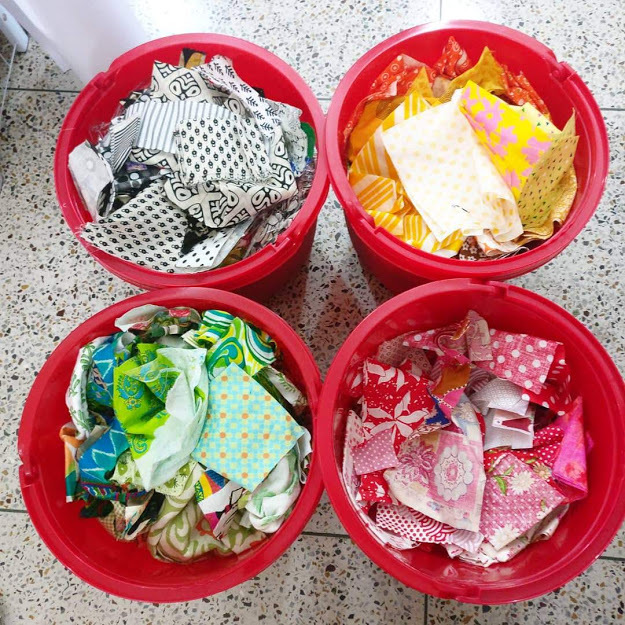 The quilts, the shopping, the generous people! 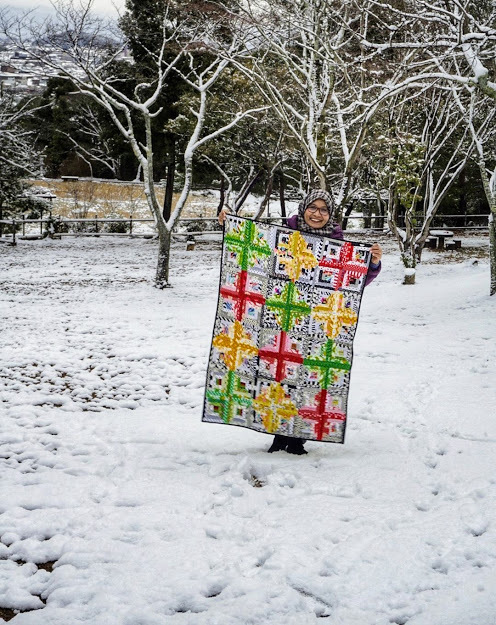 Like someone wrote on her blog, going to Tokyo Quilt Festival was like watching Olympic . Absolutely right! 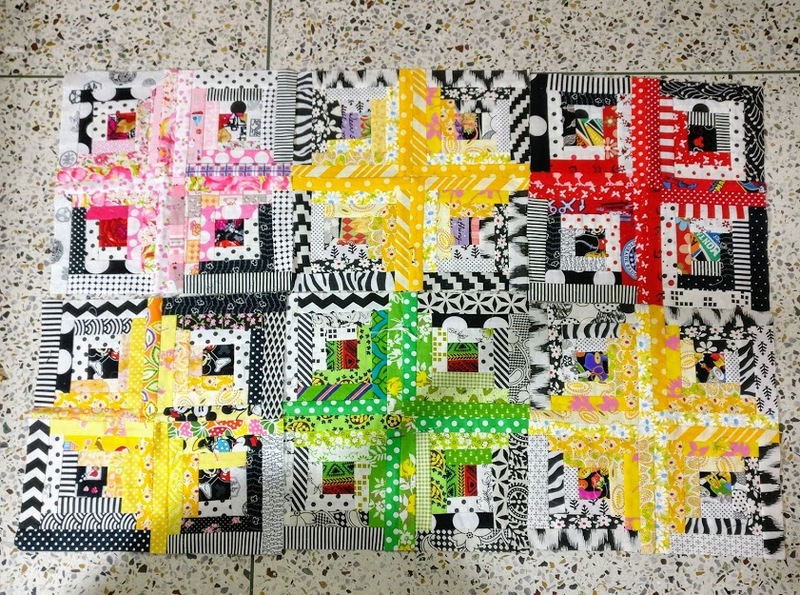 Quilt Olympic that is! As promised here is the tutorial for the zip around wallet. This method is finished with binding. 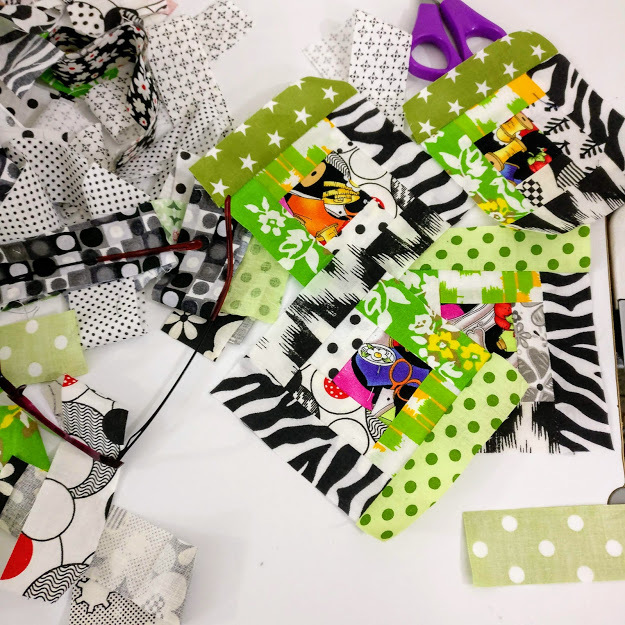 We are going to use bias binding here and you can check how to make bias binding in this Post. 1. Assembled the passport wallet as per the pattern instructions, minus the FLAP making part. sew along the edge like the above picture. Open the zipper and the wallet. We will attach the zipper from the interior part of the wallet. On the top part, mark the middle of the wallet with erasable pen. With the right side of the zipper facing up,place one end of the zipper tape approx 1/4" from the middle line. Using wonder clips, clip the tape all around and start sewing from the top with 1/8" seam allowance. Go slow around the corners. 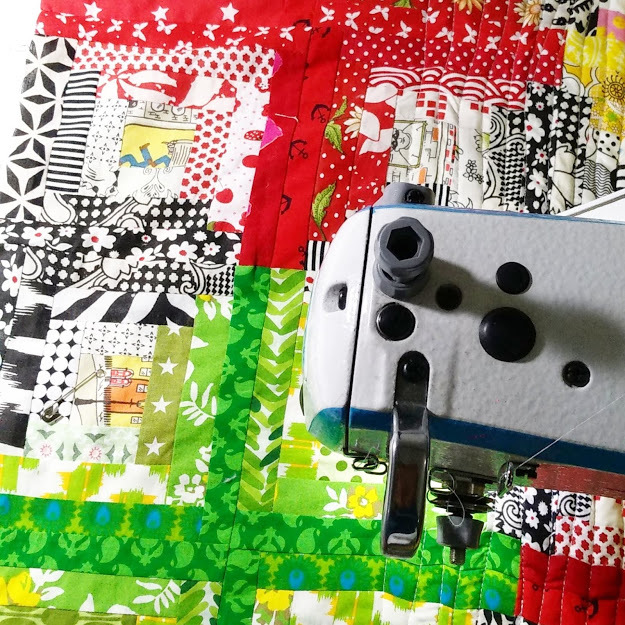 Sew one stitch at a time as you maneuver the wallet. When you reach the bottom part of the wallet, stop just at the end of the passport slot binding. Now close the zipper and draw a line like the picture below. 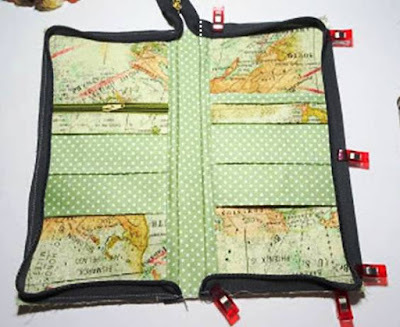 Now open the zipper again and place the marked zipper tape in line with the passport slot binding. (shown below with the dotted white line). Clip all around and start sewing from the marked line all the way to the top of the wallet with 1/8" seam allowance. Fold end of the bias binding diagonally and place it on one side of the wallet, covering the zipper tape. Sew with scant 1/4" seam allowance. Be careful while maneuvering around the corners. Remember to always push the zipper teeth away. Setting the machine speed lower will help. when you reach the bottom, just pull the zipper tail inward and continue sewing. Before turning the bias binding, slightly cut /round the corners. Last step, trim the zipper end by about 2" and encase the end of the zipper tape with a matching fabric. et Voila!! Pat yourself on the back for completing your beautiful wallet with all around zipper! Do tag me in Instagram if you make one based on this tutorial. 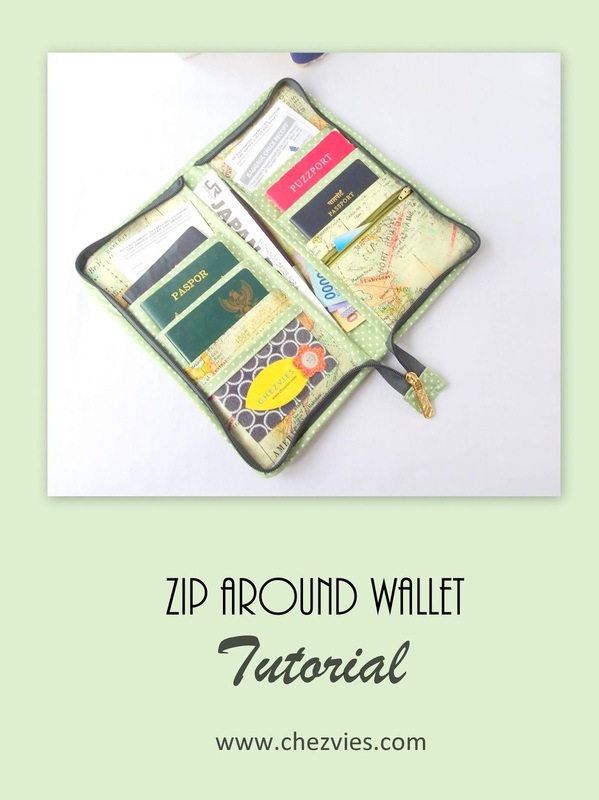 Many people asked me on Etsy if I make zip around wallet and finally I now I can give the option. 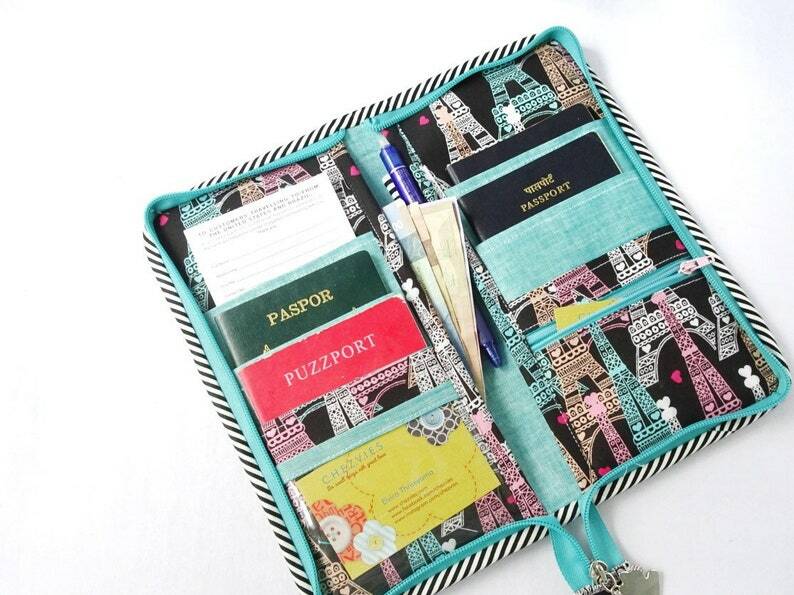 Introducing the new zip around family passport wallet! Installing all around zipper is quite tricky, because the wallet is interfaced with heavy interfacing plus batting. So I made several changes on the interfacing. I used heavy interfacing only on the main lining and using woven interfacing on the main exterior and used the same thin fleece batting for the padding. It worked out beautifully. I will take photos and maybe videos when I make the next wallet and write a tutorial for it in my next post. Make sure you subscribe to my blog so you won't miss the post. 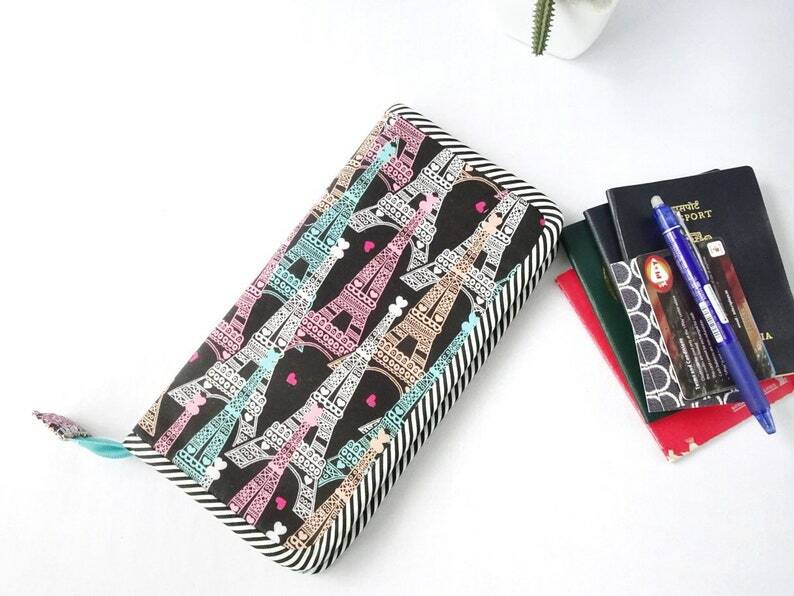 This Paris family passport wallet is now available on Etsy You can choose for 4 , 6 or 8 passports. It's very handy and keep everything securely inside. I also made the above travel wallet ( a custom order) with zip around closure. I will make more of this for stock (and I need to sew up those stash!) . The green London print fabric is finished now but I have the peach one in case you want the same print.